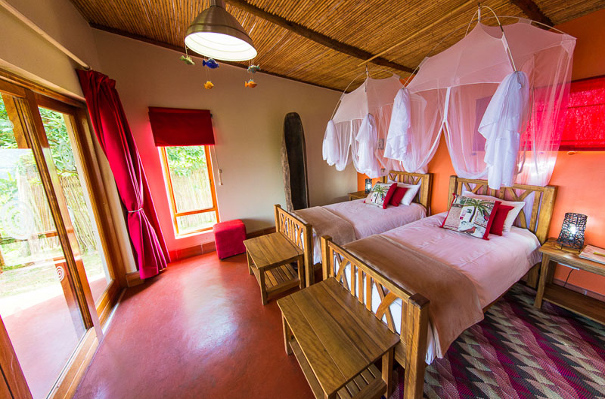 Situated between Mgahinga and Bwindi National parks and Kisoro – you will find a place full of inspiration and enjoyment called Chameleon Hill Lodge. Chameleon Hill Lodge and its breathtaking surrounding scenery offer a variety of different activities and the perfect combination of relaxation and adventure. Take your time, sit back and relax in an environment, which you have never seen before. Our friendly staff will take care of your delicious food, and all the tiny details that shall ensure that you have a pleasurable stay at Chameleon Hill. The lodge, situated on an altitude of just over 1.800 m, is the perfect location for safaris to Bwindi Impenetrable National Park, Mgahinga National Park, the Virunga Volcanoes and the Rwandan border. Most importantly - the perfect place for people looking for that ultimate “bucket list experience” – Mountain Gorilla tracking.